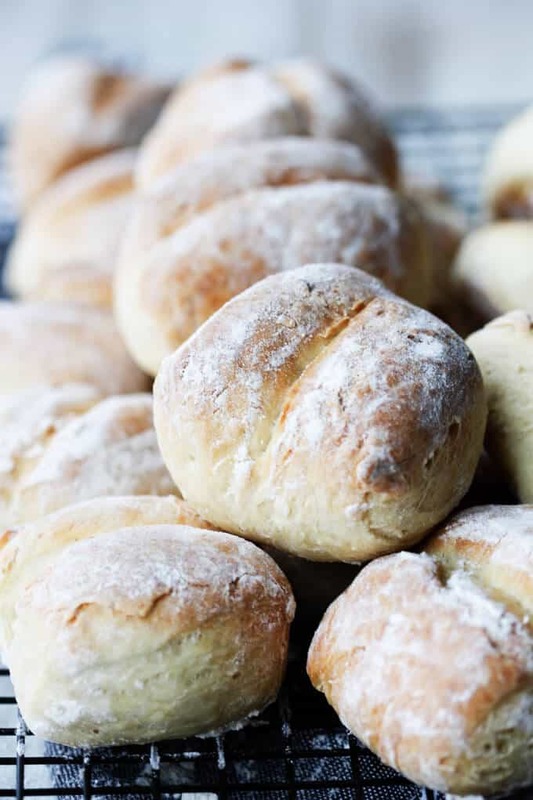 European Breakfast Rolls are a real homemade treat. 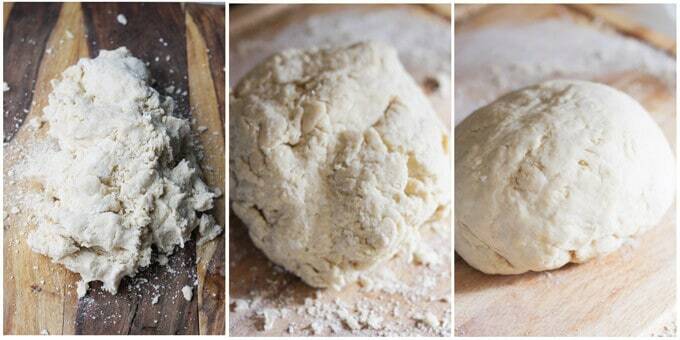 They’ll require a little kneading and a little patience but the effort is worth it. 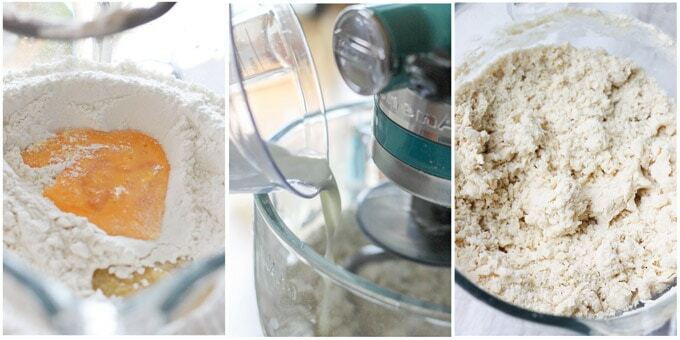 The list of ingredients is very short and simple. 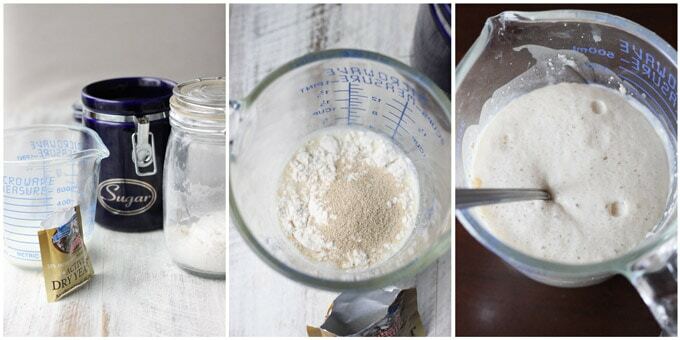 Below you will find a step-by-step walkthrough on how to make these perfectly crusty European Breakfast Rolls. Pair them with butter and some marmalade for a real European experience. Why did I call them European Breakfast Rolls? 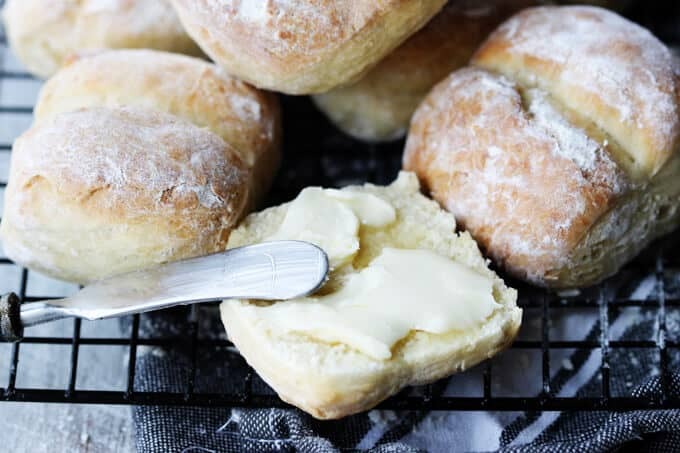 I called these rolls European Breakfast Rolls because this type of roll can be found throughout Europe, from Poland to Germany, to Switzerland and France and so on. Admittedly, the trend has since caught on here in the States, but the phenomenon will always be European to me. You’ll find that in Europe people often eat rolls for breakfast. ; ideally with some butter and jam, fruit preserve or marmalade, or some soft cheeses (like for instance this spreadable goat cheese), or even as a guest star to fried, scrambled or soft boiled eggs. I’m a fan of all of the above versions, but I especially like mine with just salted butter. 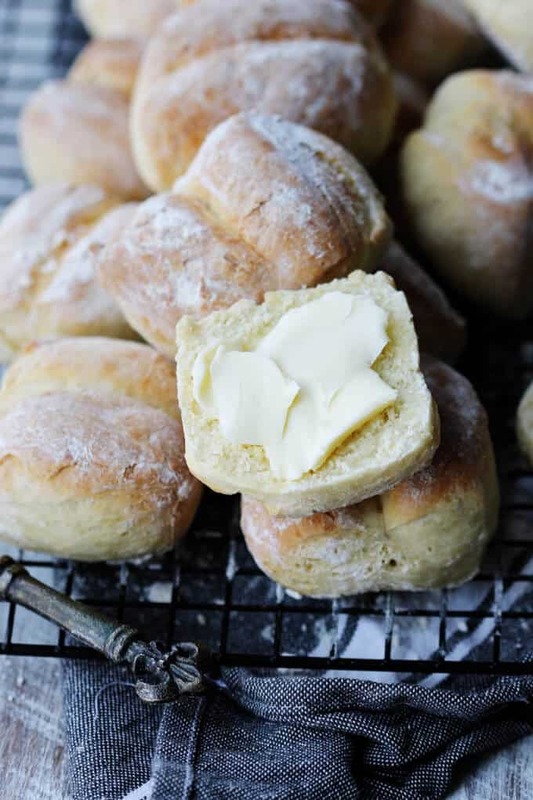 I’m not sure what it is…but a fresh roll from the oven, with a smear of salted butter, just tastes heavenly for me. But it’s a personal preference, and I know plenty of people who go for the sweet route, with some unsalted butter and jam – I don’t judge. Regardless, I can guarantee that whatever you choose to put on these rolls, you won’t be able to stop at just one. These European Breakfast Rolls somehow magically transport me back to childhood breakfasts in my hometown of Wroclaw, Poland. Isn’t it funny how food has a way of doing that? I was even under the misconception that these were known as ‘Wroclaw Rolls.’ As this post probably suggests, they were super delicious! However, they were way bigger than those I made here, but I wanted to have more small rolls than just a few large ones. 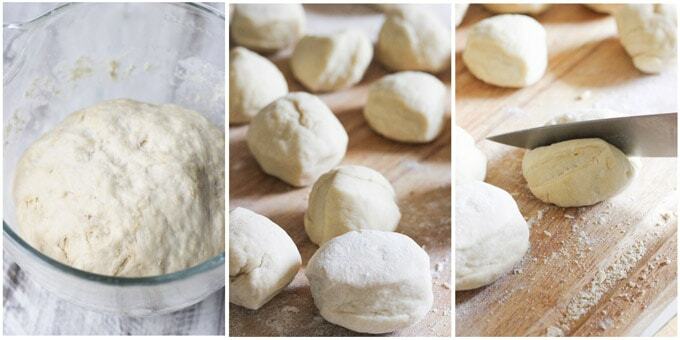 But if you’d rather, you can totally make 8 large rolls instead of 16 small ones. Ever since I made my homemade crusty bread in dutch oven, which also reminded me of bread I ate as a child, I’ve had the itch to recreate these Breakfast Rolls, and I am happy with the result. As mentioned, I decided to make these rolls small. Reason being is because I figured my little boys would prefer this size… and I wasn’t wrong. In fact, my youngest son decided to crash my photography session to steal a buttered piece of roll. Go figure…. So if there’s anyone reading this post who also remembers these rolls from Poland, give me a shout in comments, I’d love to hear from you. 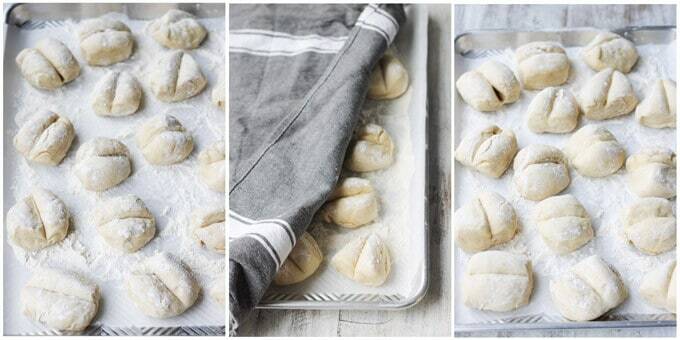 Better yet, make these rolls yourself and let me know if they remind you of those from Poland. 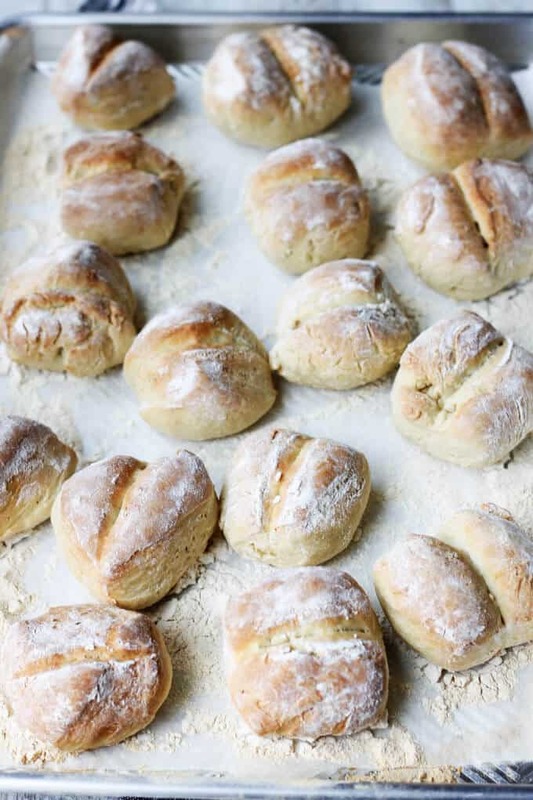 Oh and of course, if you’ve never had rolls from Poland or other European countries for that matter, and you’re curious of how they taste, then give this recipe a try and let me know your thoughts. What ingredients are needed to make these European Breakfast Rolls? 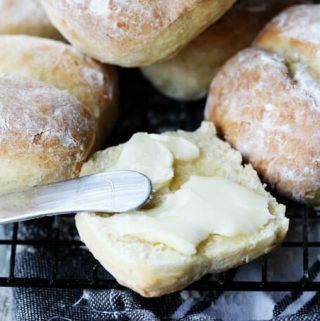 Let the rolls cool off and serve with butter or your choice of condiment! 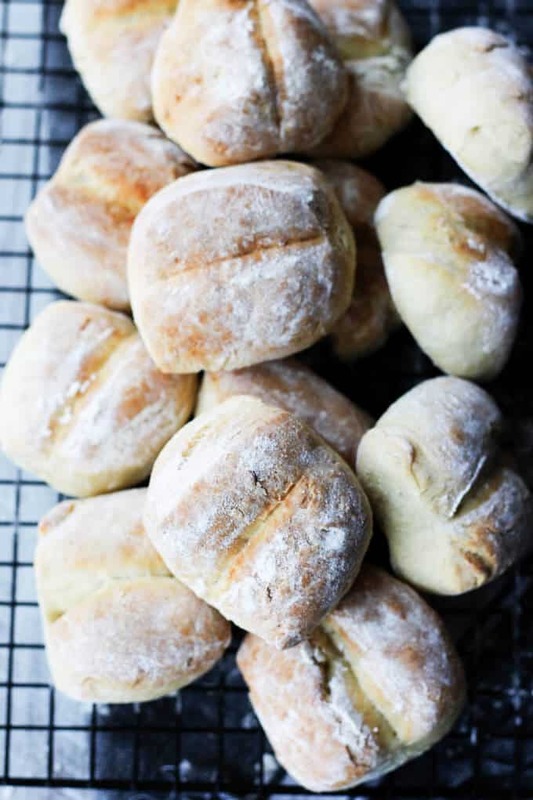 European Breakfast Rolls are a real homemade treat. 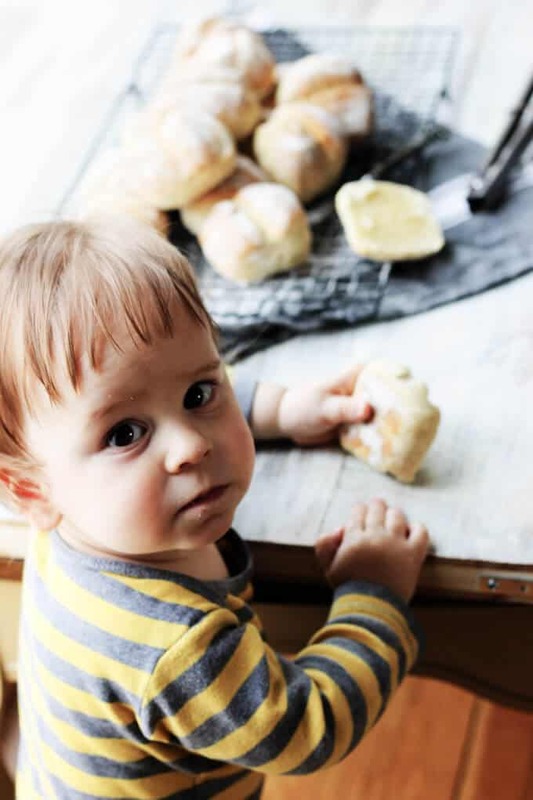 They require a little kneading and a little patience but the work is all worth it. The list of ingredients is very short and simple. Pair them with butter and some marmalade for a real European experience. Oh my goodness these are delightful! I can almost taste them through the computer screen, so fresh and flaky, but crusty and warm. My grandmother is Polish and she made us so many traditional polish foods growing up, but I don’t remember these specifically. Now I need to ask her about them. I love when food connects people through history. It’s amazing that way, isn’t is? It is amazing! So happy to hear that your grandmother is Polish. Ask her about these rolls. I’m curious if she remembers them too. These rolls look perfect, I remember eating something similar on a European vacation. 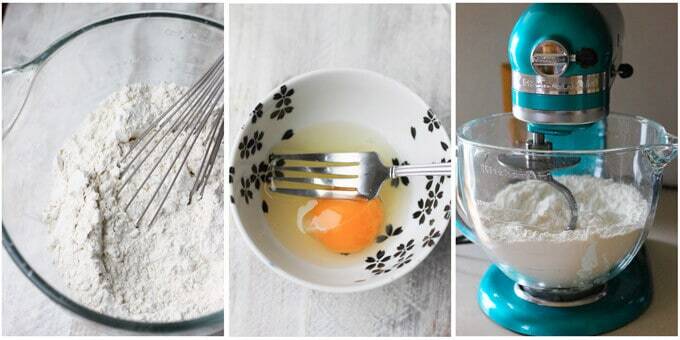 Can’t wait to make them for my family this weekend! 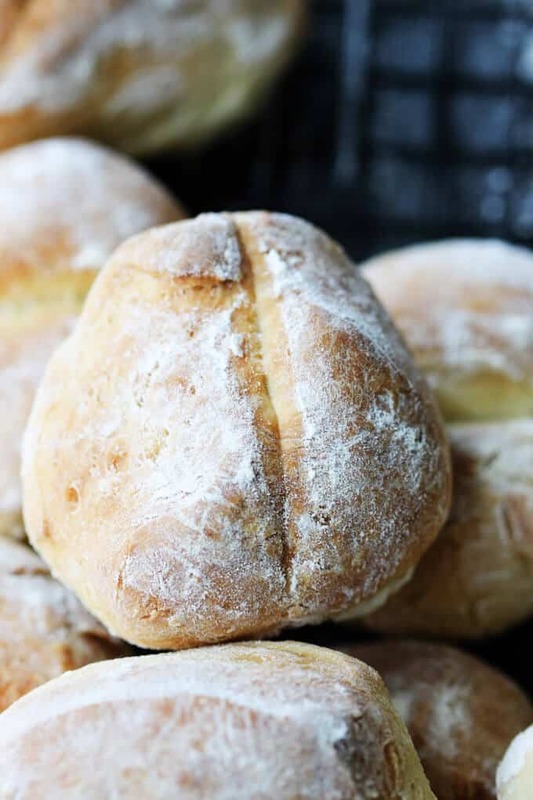 My (German) great grandmother made something that looked like these rolls… I don’t remember what they tasted like because I was pretty young when she passed away, but I remember loving them. I can’t wait to try these and see if they jog my memory! fabulous instructions thank you so much for sharing such a beautiful recipe and that baby is gorgeous!